This picture is an advert for a taxi service but as you can see it was taken outside the Cherry Tree before it was opened. 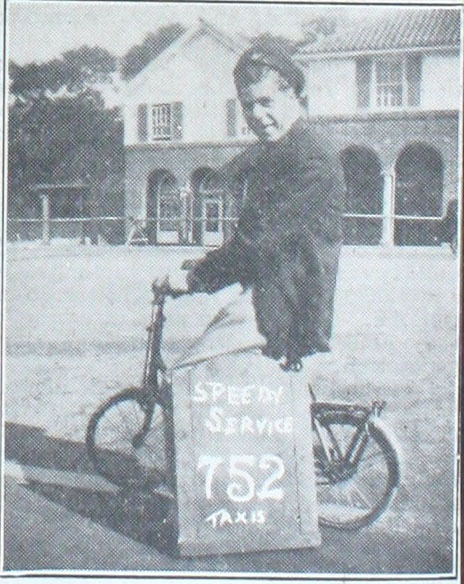 “A shilling advertisement in The Welwyn Times started the business known as “752 Taxis.” That was three years ago. “752” is now an inseparable part of the life of Welwyn Garden City. Mr Ernest Armitage , the originator of “752” is now leaving the business, which will be carried on by Mr Bibby, who has been associated with him for the past year. This page was added on 13/07/2011.